Tom Koshiol will be honored on television on Saturday night for something he never intended to do. Nine years ago, Koshiol got the idea to build a trail system by the North Fork of the Crow River through the city of Paynesville. 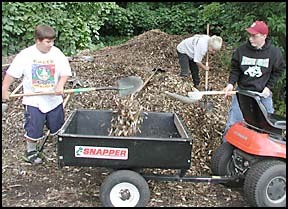 He intended to use adult volunteer labor to refurbish a neglected city park by the river, but soon found that youth were more attracted to the project than adults. 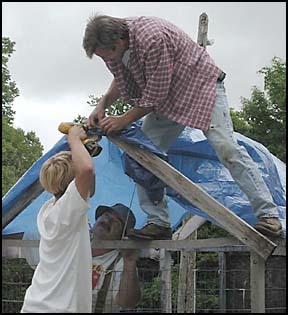 Tom (top), Joe Lingl (with drill), and Dennis Roos attach a tarp roof over the Trail Guard's aluminum can collection trailer.The group raises around $900 per year recycling aluminum cans. "From the beginning, it was just really apparent that kids were drawn to the area and the activities," explained Koshiol, who will receive an Eleven Who KARE Award live on KARE-11 at 9 p.m. on Saturday night. "More kids than adults showed up," he added. He had the idea of calling the group the Honorary Crow River Trail Guards and his employer - Voss Plumbing and Heating - donated shirts to make the group official. Since then, the group has made and maintained a mile of trail and created a nature park on the banks of the river, but the finished product has proven to be less valuable than the effort by the kids, the bonding by the group, and the sense of purpose that getting out of bed on Saturday mornings to work in nature can give to youth. "It's really turned into much more of a youth group," admitted Koshiol, while perched on a concrete picnic table under the picnic shelter the group built. "That never really was my intention. It just sort of happened." In all, 155 kids have been Trail Guards. Each year, the group has around 50 members - ages eight to 19 - of which 35 are active. 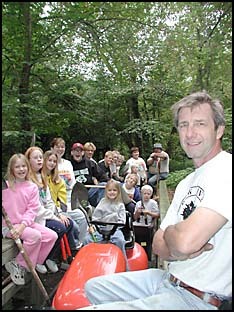 Each week, the group averages about 18 kids on Saturday to help maintain and improve the trails and park. Tom with the Trail Guards in the background at the Crow River Nature Trail which they work on each Saturday morning during the summer. Koshiol's son, Joey, 19, has been a Trail Guard for years, and his son Jacob, 5, and wife, Patrice, also like to come on Saturday mornings. The group now meets regularly every Saturday morning from 9 a.m. to noon from Arbor Day in late April to the end of October. They meet at the nature park at the end on the north end of Burr Street and always end their day with a group lunch. The group has a mixture of kids: different ages, different gender, different backgrounds. He treats them all as individuals and tries to promote a positive, wholesome experience for them with nature..
"That's one of the things I feel so good about," he explained. "It gets these kids down here instead of playing Nintendo, watching the tube, or sleeping 'til noon." "I think it gives them a real feeling of belonging without expectations," he said. "They can come down here and sit on the picnic table." Just sitting, feeling the breeze, watching the river flow is a positive experience, he feels. Koshiol, who grew up in Paynesville himself, has only three rules for the group. (1) Nobody has to work. (2) No swearing. (3) No smoking. "They don't have to come," he added. "They come because they like it." The most important rule, though, is an unwritten one: nobody gets kicked out. Everybody has bad days, Koshiol knows. "That (rule) forces us to work through (situations) instead of saying, 'Get out.' Kids don't need to hear that ever," he stressed. This unwritten rule is really another way of saying, "Love them no matter what," said Koshiol. Koshiol was nominated for the award by Dr. Jim Hess, another Paynesville native who was chosen as an Eleven Who KARE last year for his work providing eye care in the Third World. Koshiol was one of the 11 winners this year out of 289 nominees. "I didn't really know how to take it at first," he said of the award. "So many people do so much volunteer work. I just do what works for me." He said he has accepted the award as a great personal honor and as recognition to his family and the organization, which he hopes will benefit from the publicity. "It's another sign that things are working pretty darn well," he said. "It's a heckuva pat on the back." 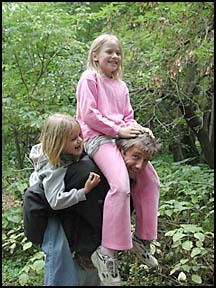 Tom giving a couple Trail Guards a piggy back ride. The real rewards, though, come from working with kids each week. These rewards, he stressed, are endless. It's "all a labor of love," he said of his volunteer work with the group. "I absolutely enjoy it, or I wouldn't do it." Members of the Trail Guards agree that Koshiol deserves the award. James Jansen, 15, in his seventh year as a Trail Guard respects Tom's dedication. "He could be fishing or spending time with his family," Jansen said, but instead he comes every Saturday to work at the nature park. "I like to come because you get away from the town," added Jansen. "It's a miniature Boundary Waters." "Tom is nice and he's my friend," added Nikki Garvick, 9, a first-year Trail Guard. "I like to come here to have fun and do chores." Friendships made among the Trail Guards keep the kids coming back each week, they say. "I like to see my friends," said second-year Trail Guard Sarah Anselment, 12. "I usually wake up early (on Saturdays) and I just want to come here." A KARE-11 camera team came out to Paynesville in July to shoot video of the group working and playing for a two-minute video clip of the organization that will be shown Saturday night. Part of the video will be from the group's annual canoe and kayak picnic cruise on Lake Koronis. Writing a 45-second speech to give on live television was difficult for Koshiol to do. His first draft was twice as long as it could be, and he found himself cutting names of people he wished he could have thanked. "There are a lot of people who have done so many things," he explained. "I hope they know that I haven't forgotten their contributions." The Crow River Trail Guards have become so successful, and so involved, that Koshiol can't do it all himself anymore. The organization now employs five people to handle the charitable gambling that funds it, to organize the Boundary Water canoeing trips and white-water rafting adventures that reward the youth for their work, and help supervise on Saturday mornings. Koshiol still volunteers his time. The Trail Guards have even expanded to working some over the winter by doing "My Room" projects. Because kids' bedrooms can be a low priority during house remodelings, this effort has kids fixing up bedrooms, and the organization furnishing them. Koshiol has intentionally never taken taxpayer money for the organization, preferring to keep the organization independent. It has evolved over the years as circumstances warranted. Jesse Lembcke and James Jansen load wood chips for the trails into the wagon. Helping them is Keegan Rudy. Getting a steady stream of funding, though, helped immensely, said Koshiol. The organization has pulltabs in three bars in the area, which can be used for improvements on the trail or park or to reward the workers. Before, Koshiol had to do a lot of begging and fund raising. One of the reasons the organization needs funds is so it can function at no cost to the kids. Koshiol learned through experience that a $10 fee or a requirement to bring a packed lunch could keep a kid from attending a group activity. "That's when I decided: we're not going to charge a dime for anything," he said. Koshiol - whose involvement with the Trail Guards has led to his serving as the chairman of the city's tree and park committee - has no firm plans for the future. He does hope to make the Trail Guards a self-sustaining organization that will be able to carry on after he calls it quits, but that isn't likely to be any time soon. "I just enjoy it too much to even think about that," he said.